NASA's Mars Exploration Rover Opportunity completed a drive on July 17 that took the vehicle's total driving distance on Mars past 20 miles. After seven years of stop-and-go driving, NASA's intrepid Mars rover Opportunity has covered just over 20 miles on the Red Planet — more than 50 times the rover's original distance goal. A drive of 407 feet (124 meters) on July 17 took Opportunity past the 20-mile mark, mission scientists said. And the golf-cart-size rover has just kept chugging along since then; as of July 27, Opportunity's odometer read 20.49 miles (33.0 kilometers). Since mid-2008, the rover has been headed for a huge Mars crater called Endeavour, and it's finally almost there. Opportunity is less than 0.3 miles (0.5 km) from Endeavour at this point, researchers said, so it should arrive in a matter of days. "The numbers aren't really as important as the fact that driving so much farther than expected during this mission has put a series of exciting destinations within Opportunity's reach," said Alfonso Herrera, a rover mission manager at NASA's Jet Propulsion Laboratory (JPL) in Pasadena, Calif., in a statement. The yellow line on this map shows where NASA's Mars rover Opportunity has driven, as of June 2011, after landing on Mars in January 2004. Opportunity should reach one of those destinations, Endeavour Crater, after just a few more drives. Endeavour is about 14 miles (22 km) wide, and its western rim exposes outcrops that record information older than any Opportunity has examined so far. The crater's rim also harbors clay deposits, a strong indication of the presence of past water activity on Mars, scientists have said. Opportunity's drive on July 17 — the 2,658th Martian day, or "sol," of the rover's exploration of the Red Planet— included an autonomous hazard detection portion, during which the rover paused at intervals to check for obstacles before proceeding. "Autonomous hazard detection has added a significant portion of the driving distance over the past few months," Herrera said. "It lets us squeeze 10 to 15 percent more distance into each drive." Opportunity chugged backward on its milestone-reaching drive, researchers said. Mission scientists have been driving the rover backward for a while, in an effort to extend the life of a motor in the right front wheel that sometimes draws more current than the other five wheels' drive motors. "Opportunity has an arthritic shoulder joint on her robotic arm and is a little lame in the right front wheel, but she is otherwise doing remarkably well after seven years on Mars — more like 70 in 'rover years,'" said JPL's Bill Nelson, chief of the mission's engineering team. "The elevated right front wheel current is a concern, but a combination of heating and backwards driving has kept it in check over the past 2,000-plus sols." 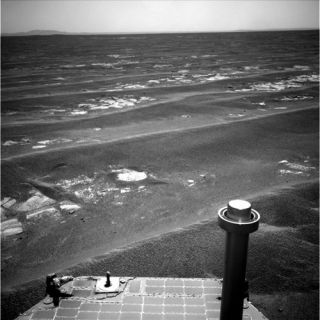 Opportunity and Spirit were sent to Mars to search for signs of past water activity on the planet. Both robots delivered in a big way, finding lots of evidence that the Red Planet was once a much wetter, warmer place. The twin rovers completed their three-month prime missions in April 2004, then continued on bonus missions for years afterward. Spirit stopped communicating with Earth in March 2010, and NASA finally pronounced the rover dead this past May. But Opportunity is still going strong.